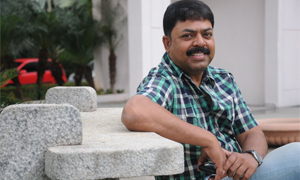 James Vasanthan was born in Tiruchirapalli (Trichy), studied first at YWCA Matric Higher Secondary School(Present BHEL Matric) and later at Bishop Heber School and later, graduated in English literature in Bishop Heber College. Later, he graduated in Carnatic music from Madras University and in Western music from Trinity College, U.K. and even holds a diploma in Theory of Music. Though music was his "first love", he forayed into TV channel business by working as an anchor in some popular Tamil TV channels. In 2003, James Vasanthan launched his pop album titled "Vasanai". Even before that, he has composed music for many good Christian cassettes numbering around 300, like "Amarntha Meliya Satham" (Lyrics:Suresh Frederick), "Sinthanai Sei", "Friends", "Iravin Amaithiyil Yesuvodu" etc. In 2008 then, he eventually entered the Chennai film industry as a music director by composing the songs and score for the Tamil film Subramaniyapuram, directed by M. Sasikumar, who was a student at St.Peter's Public School in Kodaikanal, where he went to teach music after his post-graduation. which brought him into prominence with the film's soundtrack gaining fame and being praised and the song "Kangal Irandal" topping the charts and being cited as the "anthem of the year among the youth".